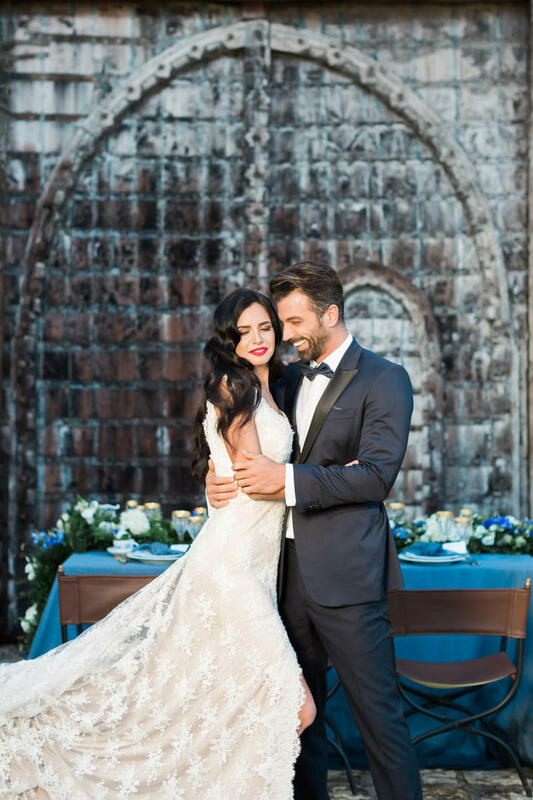 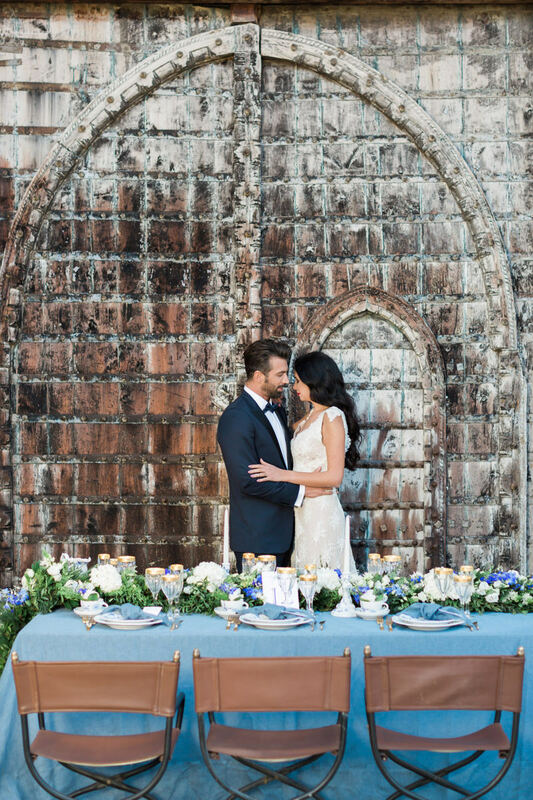 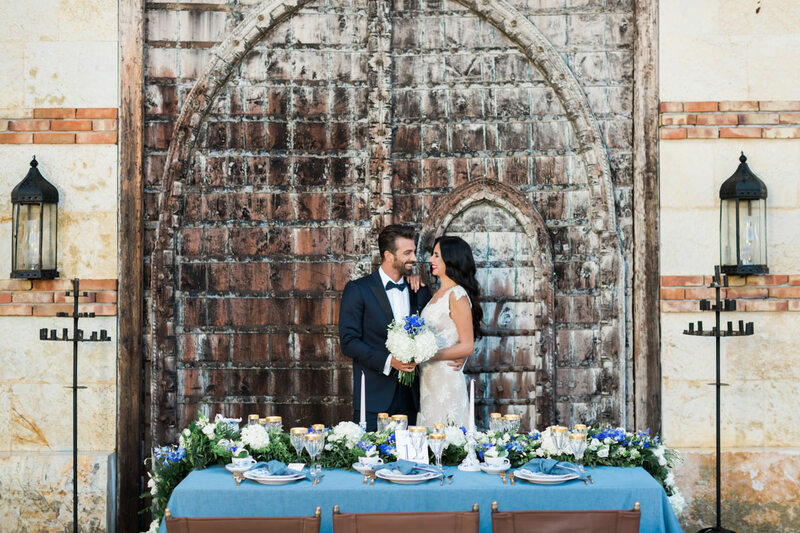 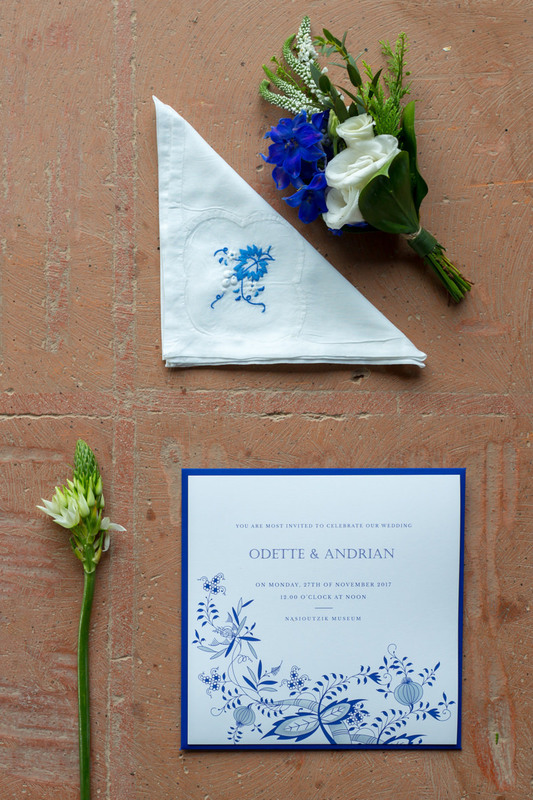 The Royal Blue story of Odette & Adrian starts in a authentic Byzantine scenery, in Nasioutzik Museum, unfolding the story of two people who fell in love! 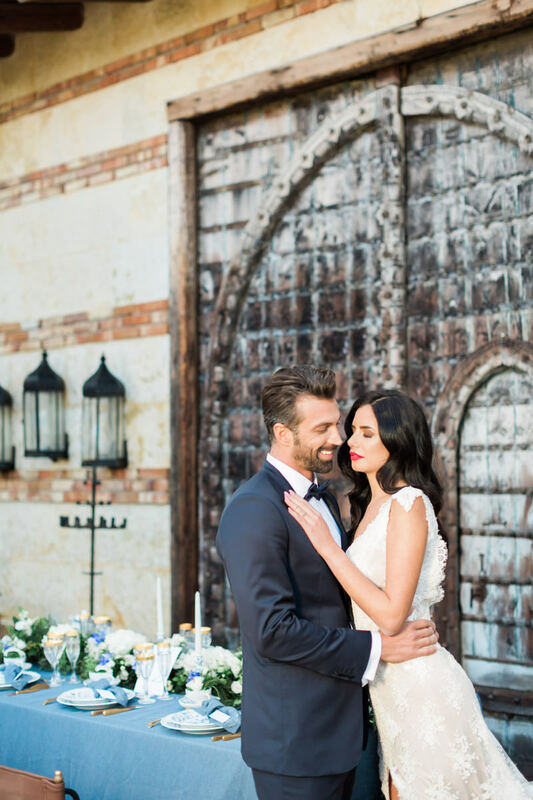 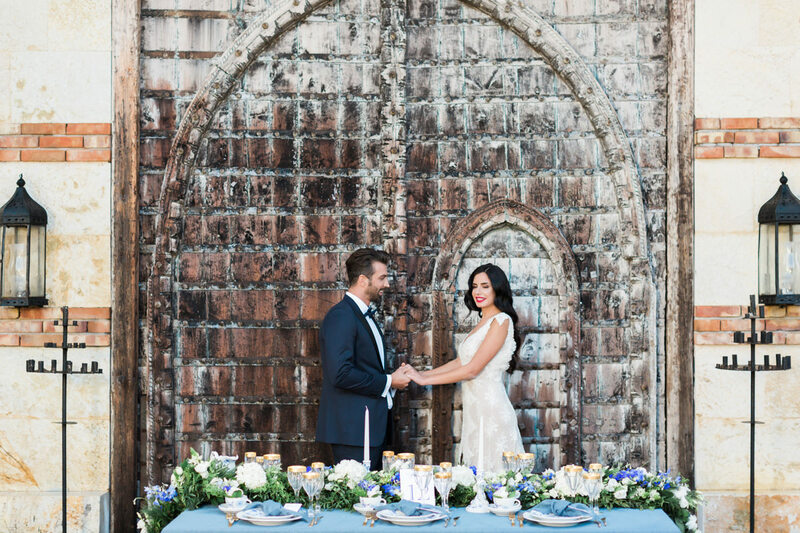 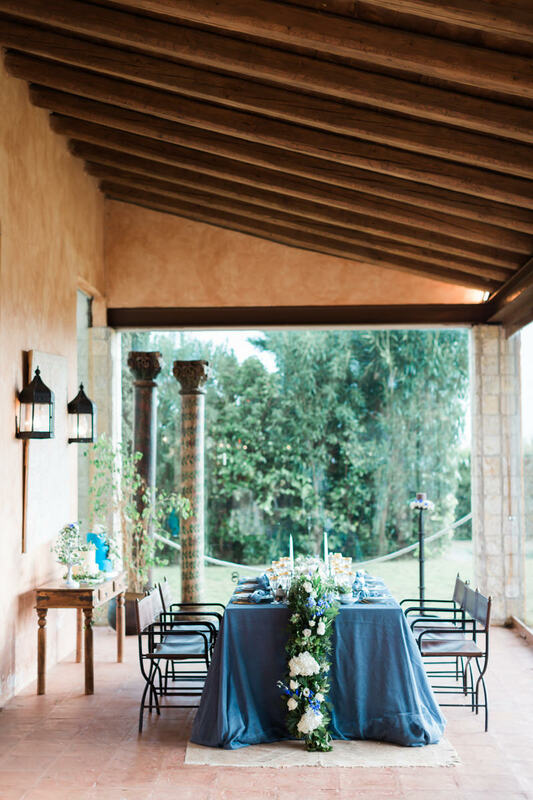 Wood and stone-like landscapes are the dominant elements of this romantic estate. 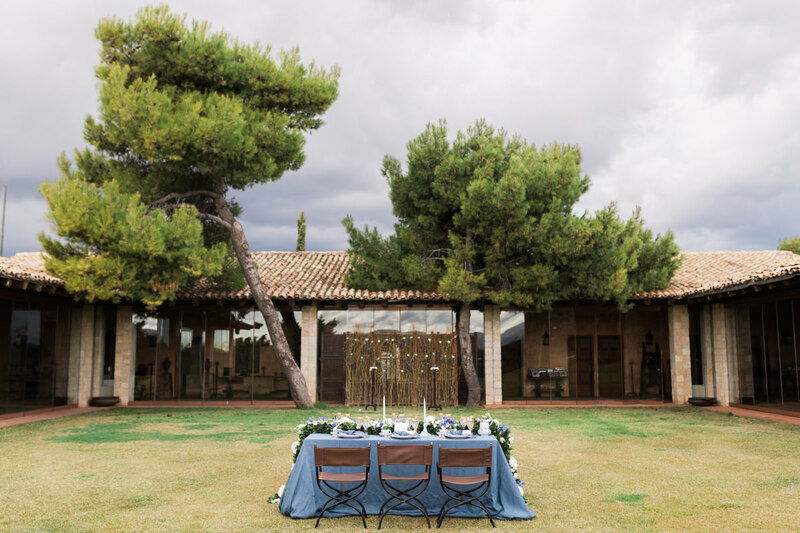 They are surrounded by olives, cypresses and pines composing the original aesthetic. 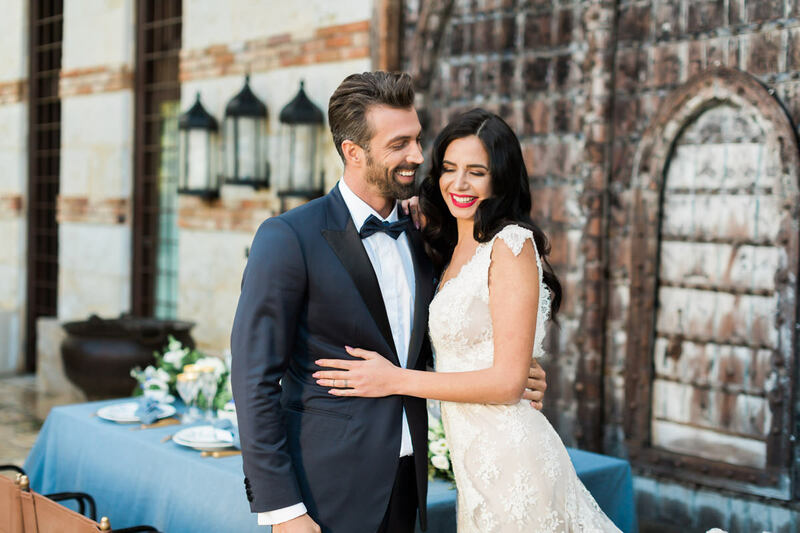 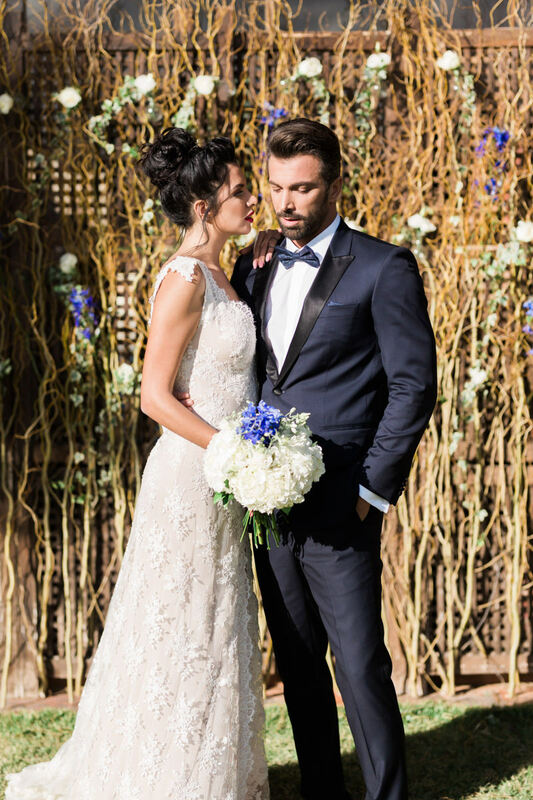 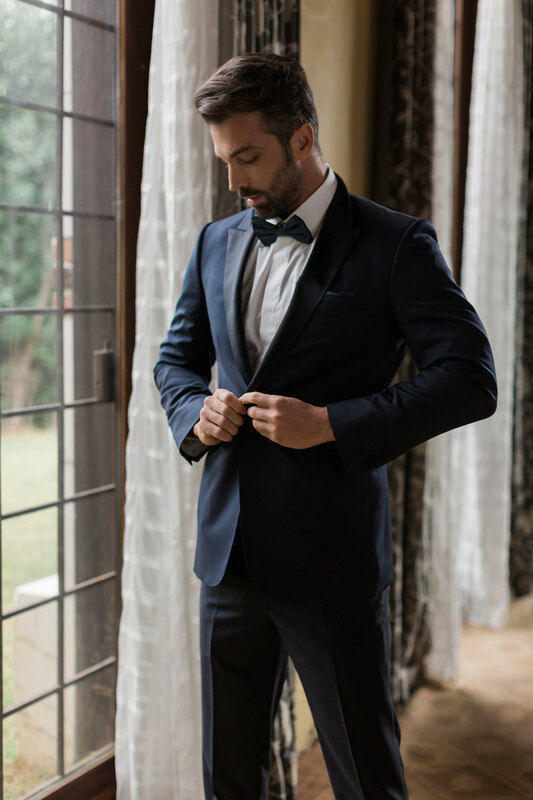 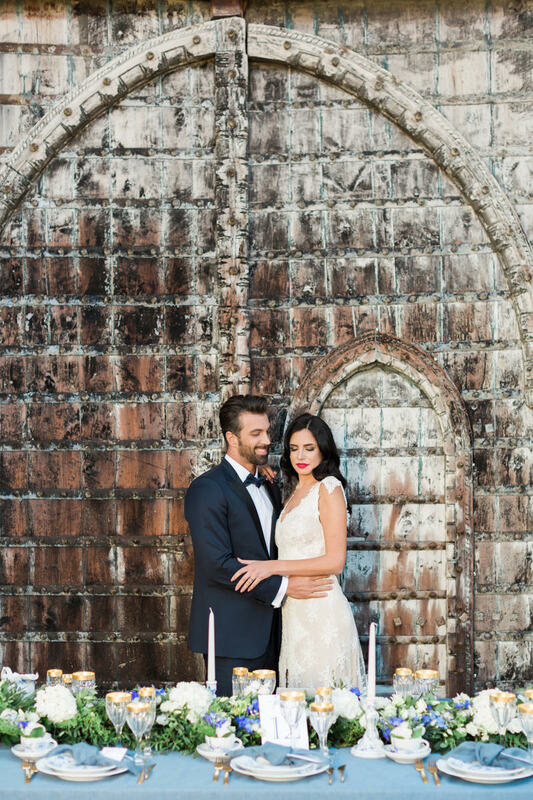 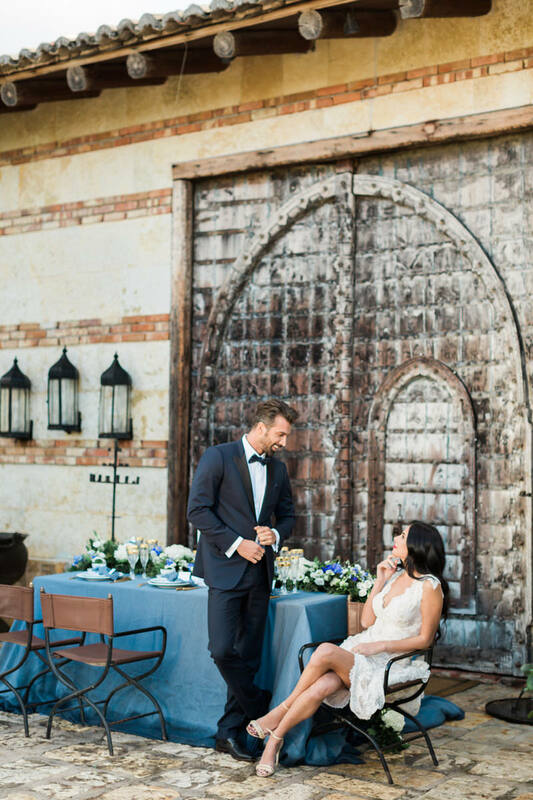 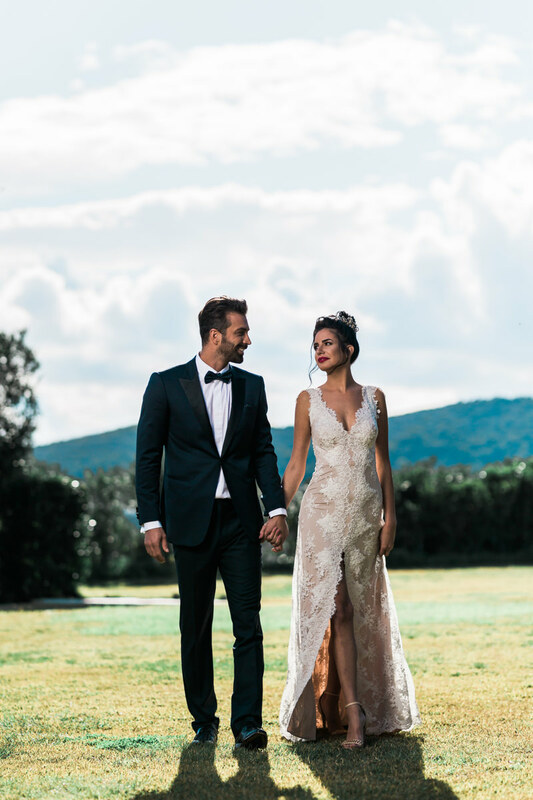 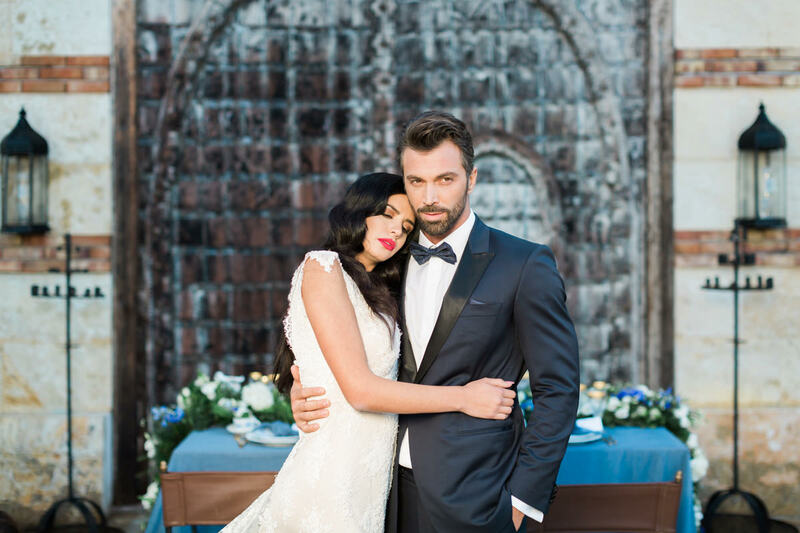 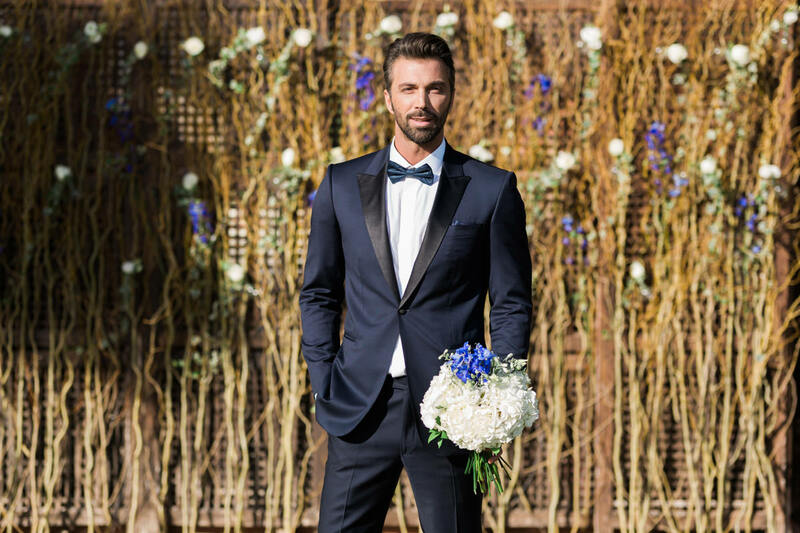 Our couple gazes at each other, during their getting ready session and there’s not really much to tell… but to watch their story through the eyes of Dimitris Giouvris. 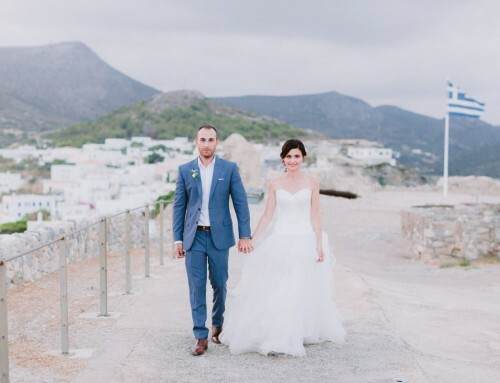 Videography credits goes to Wedmemories while all the sneak-peek backstage shots, belong to Theofilos Venardos. 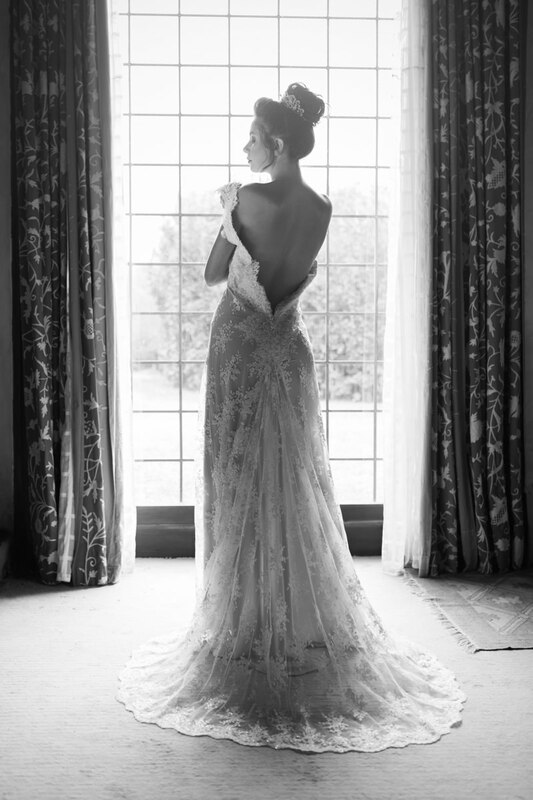 Odette looks herself in the mirror as she is getting ready for the big day. 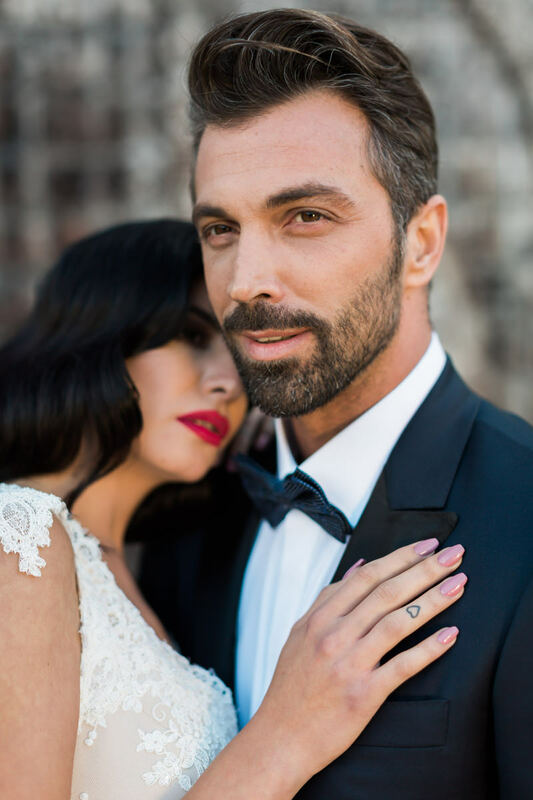 Adrian approaching fixing her carefully artfully bridal hair, created by Ilias and staff team. 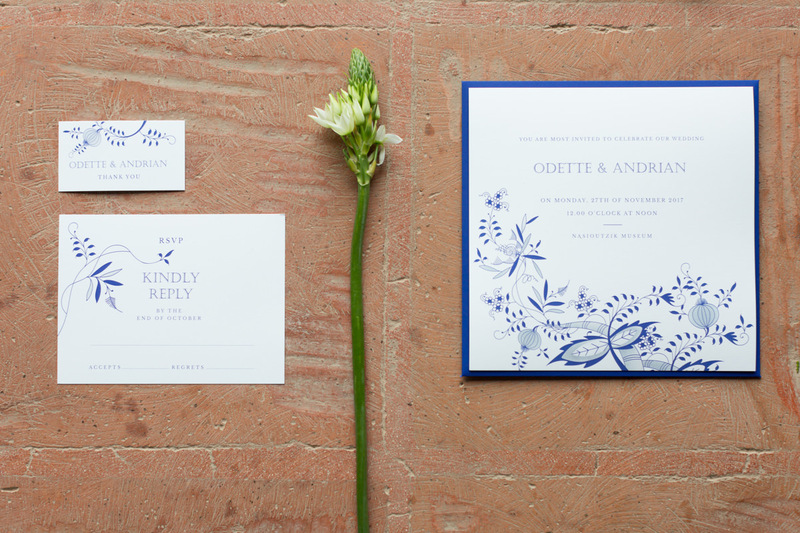 Odette’s make-up was taking care by the talented Adamantia Katsampi. 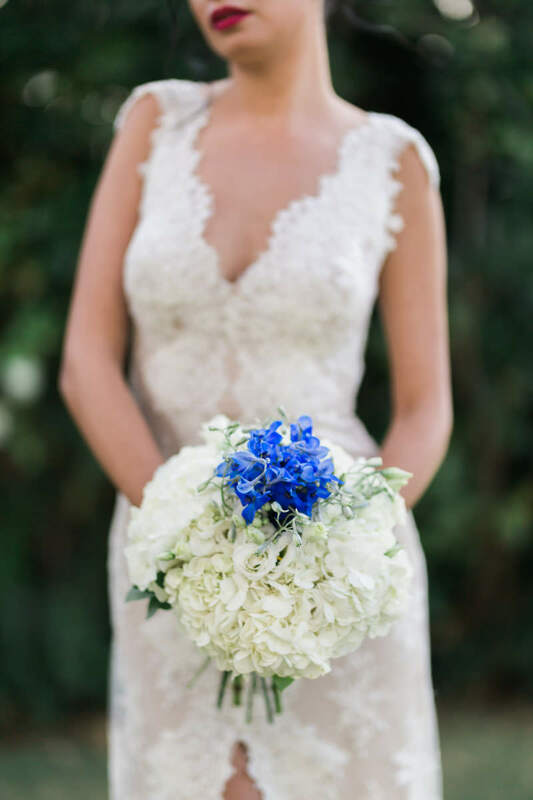 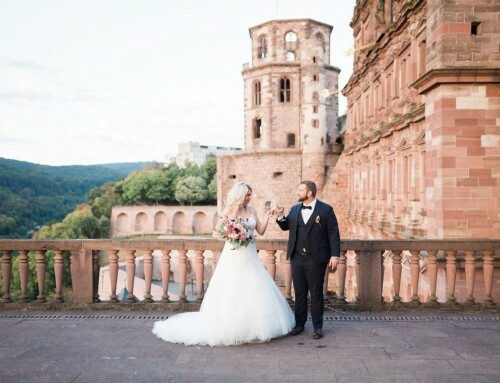 She is wearing a dress made of French lace, embroidered with crystals and Payette. 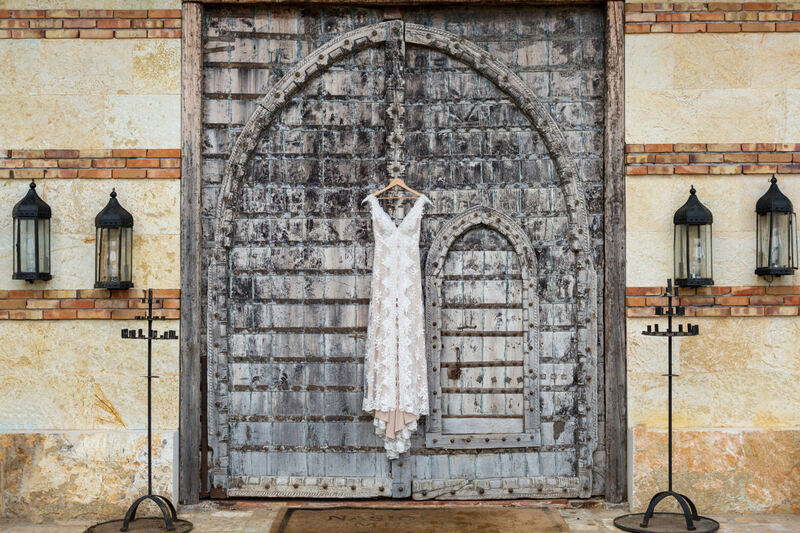 Impressive embroidery on the neckline and on the front slit, all created by the super-talented Elena Soulioti. 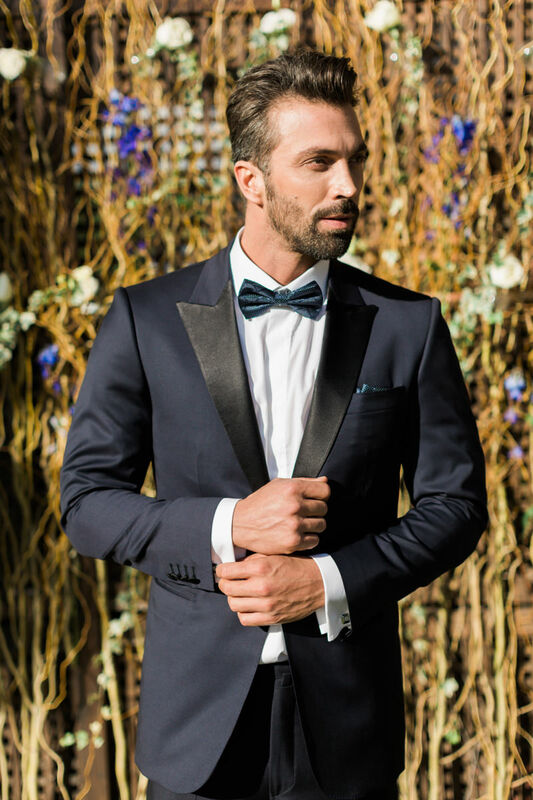 Adrian is looking handsome in his cool wool suit, in smoking one button slimline. 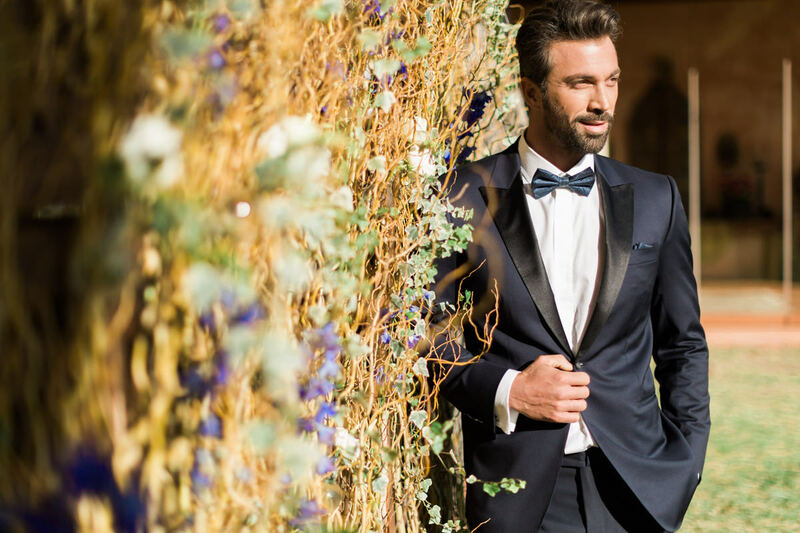 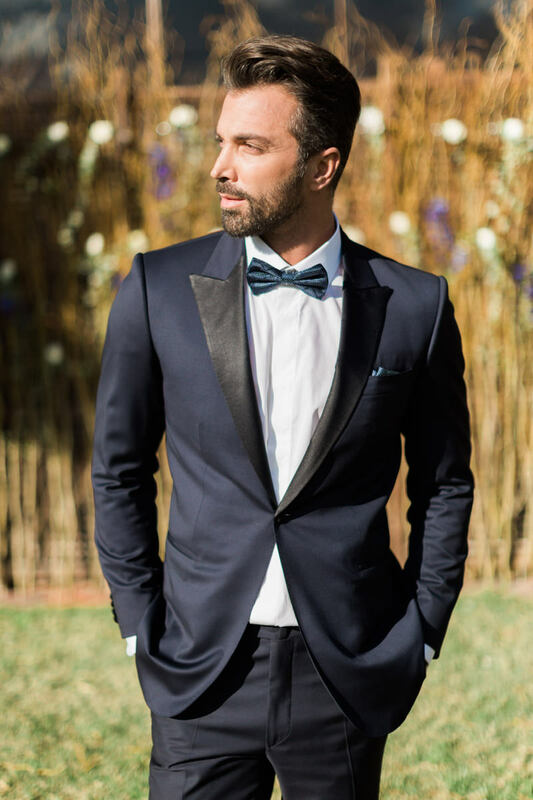 His handmade bow tie and pochette and leather shoes, all handmade by Takis Giannetos. 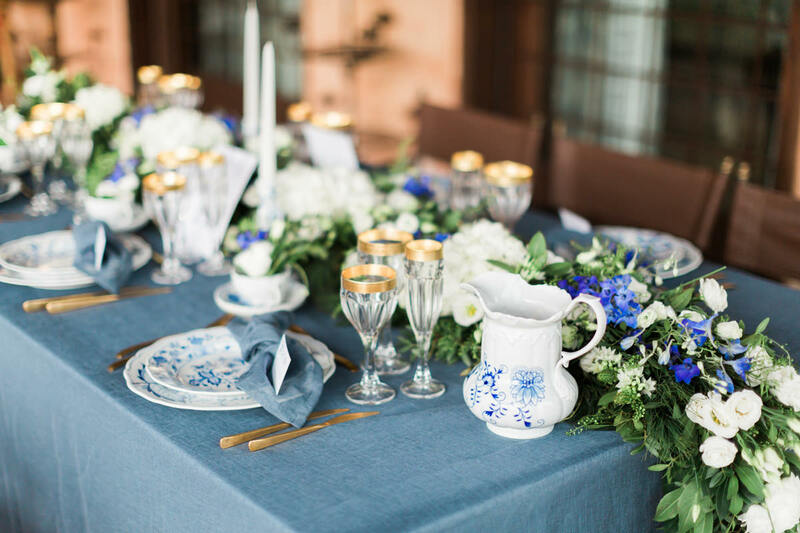 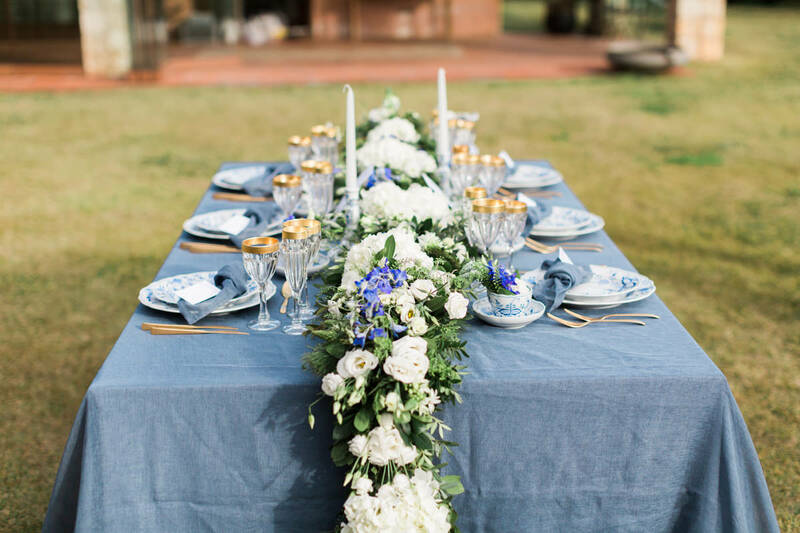 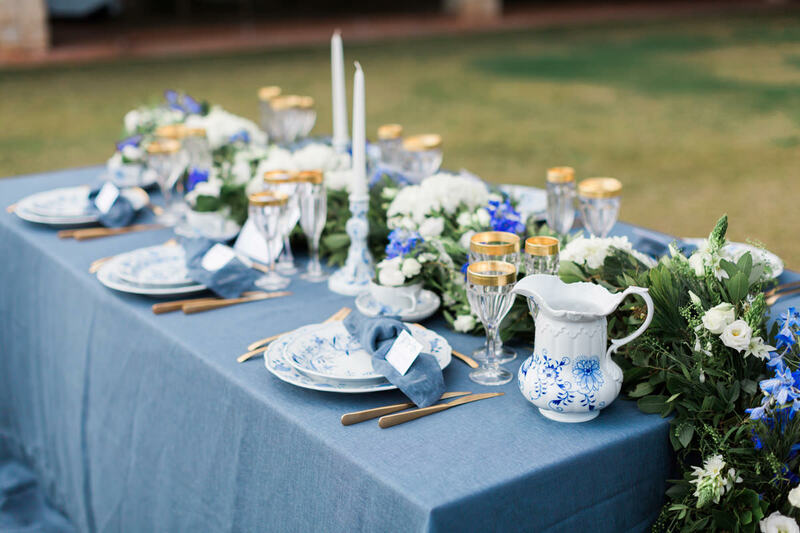 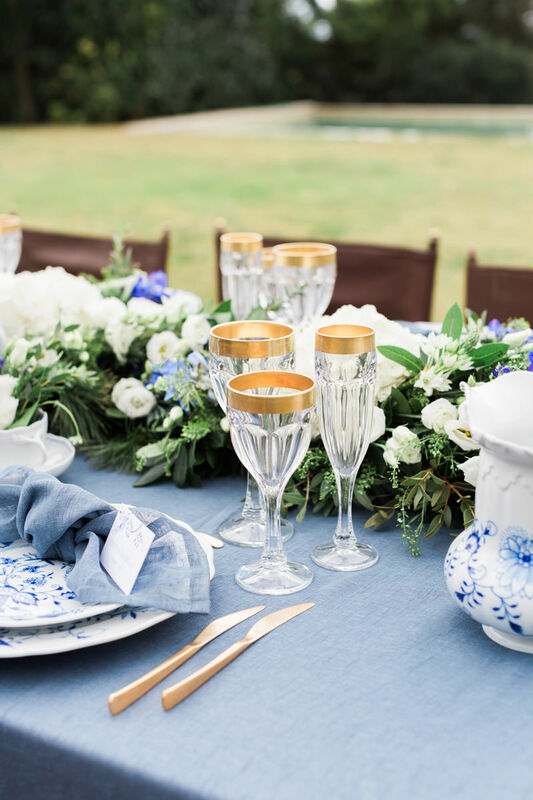 What to say about the exquisite Blue Onion dinnerware porcelains by Meissen & more, which brings in a unique handcraft and exclusive aesthetic luxury to our story, complimenting us as well as each and every guest! 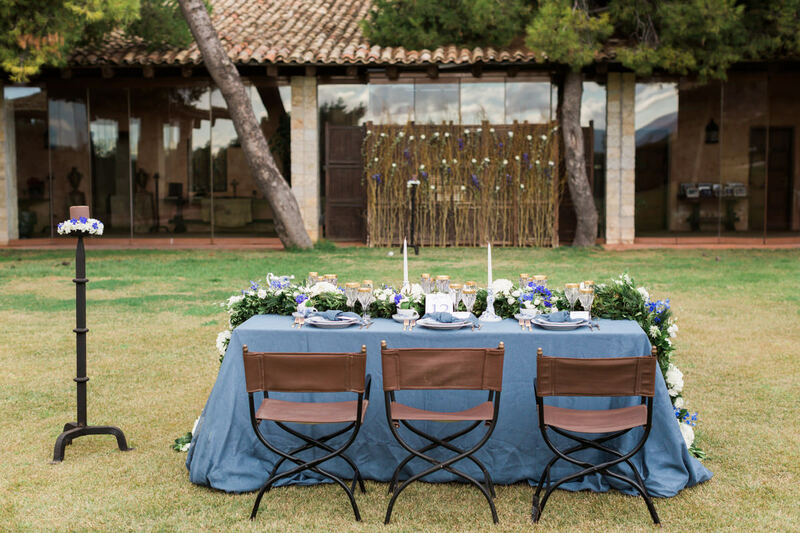 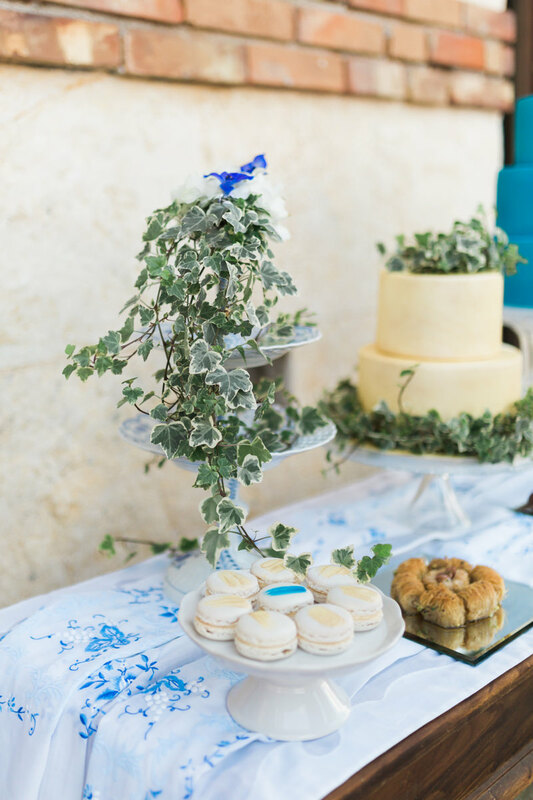 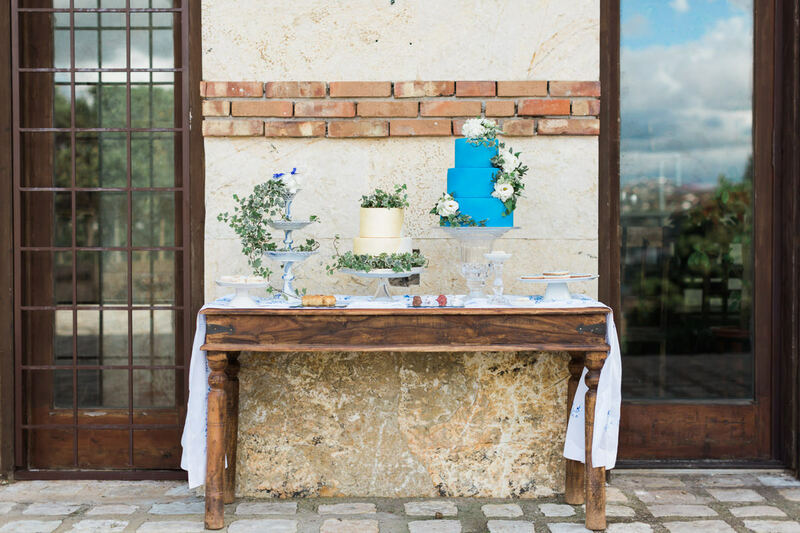 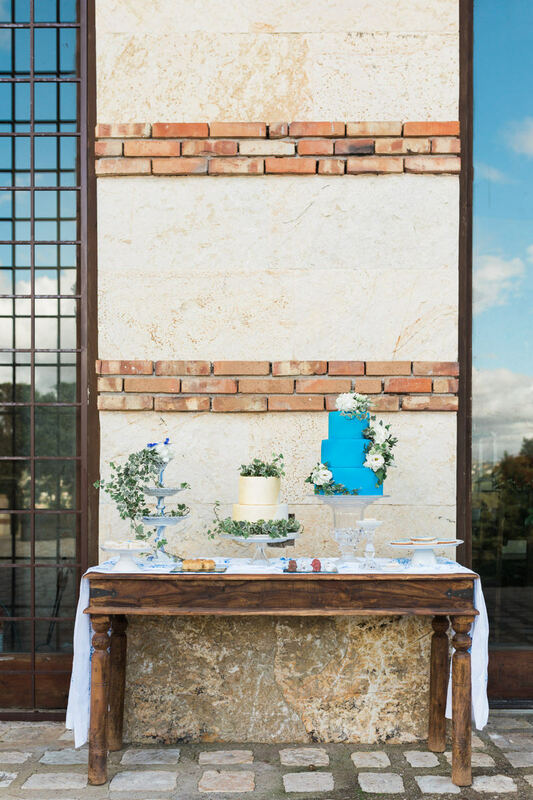 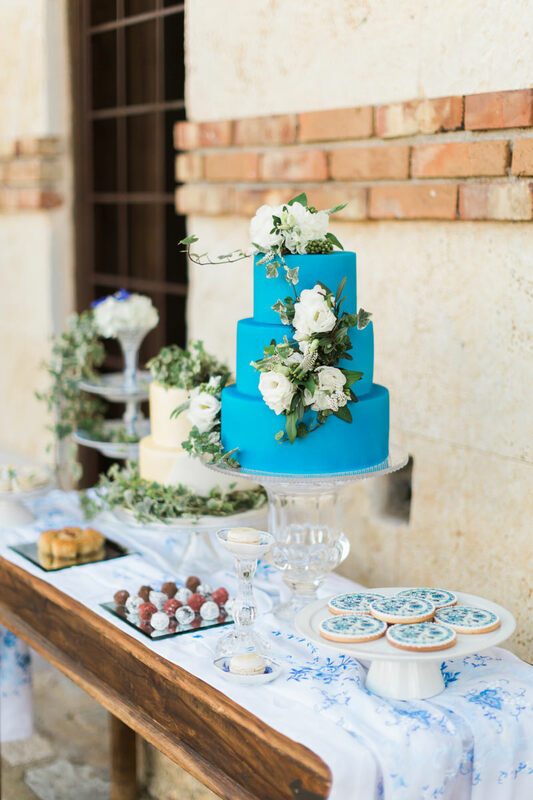 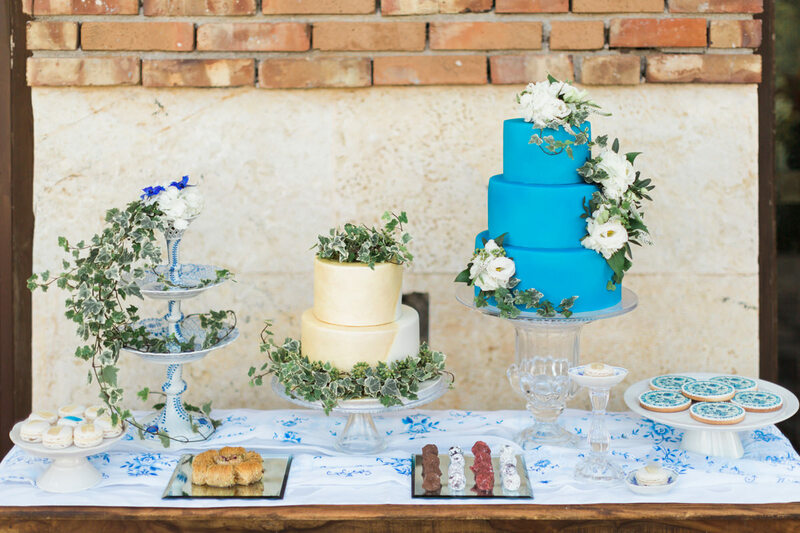 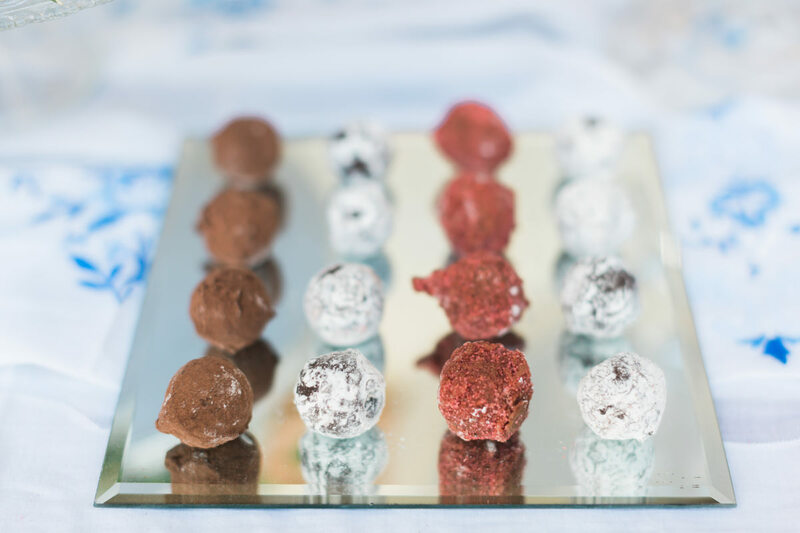 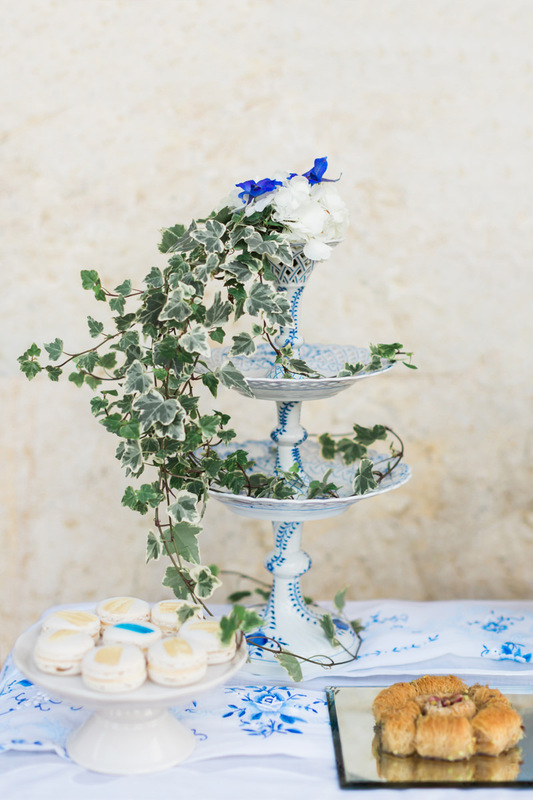 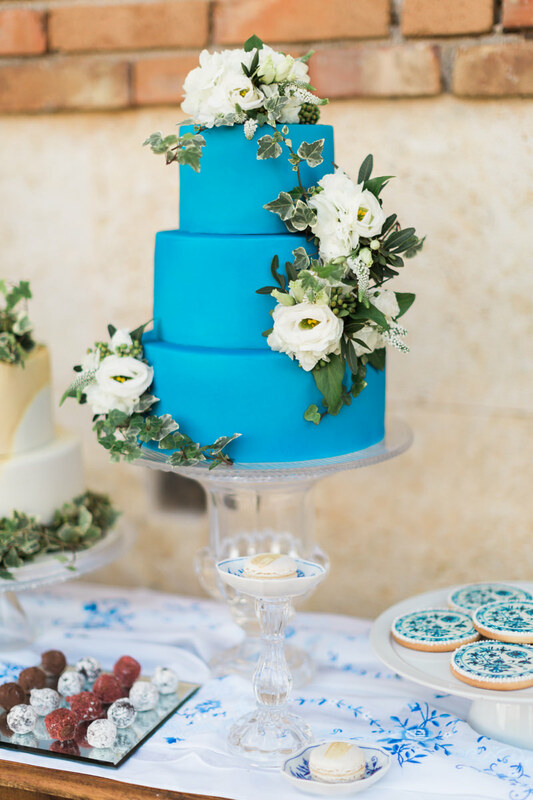 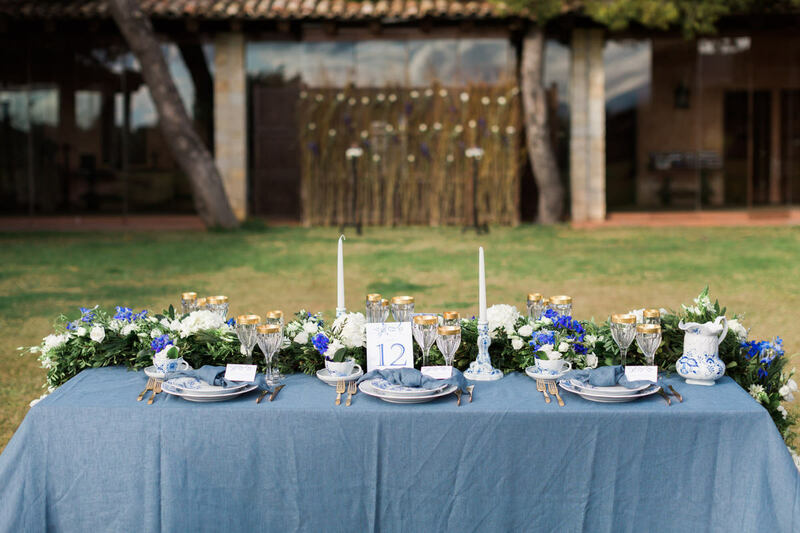 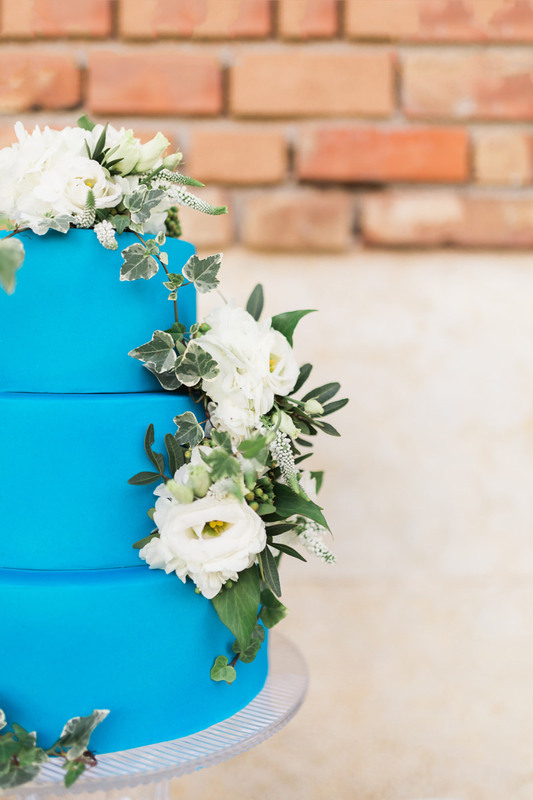 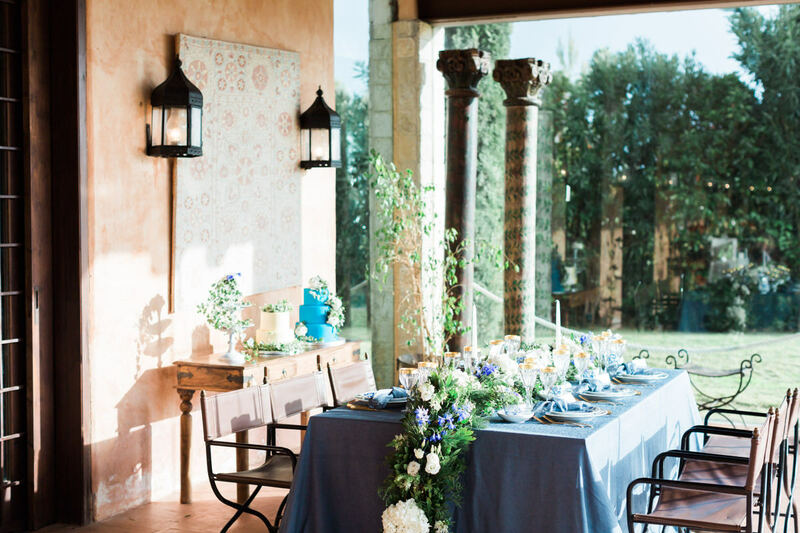 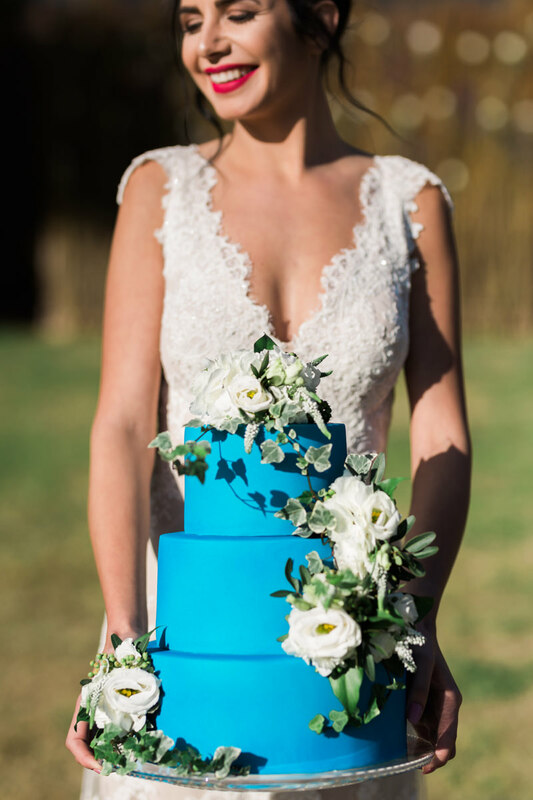 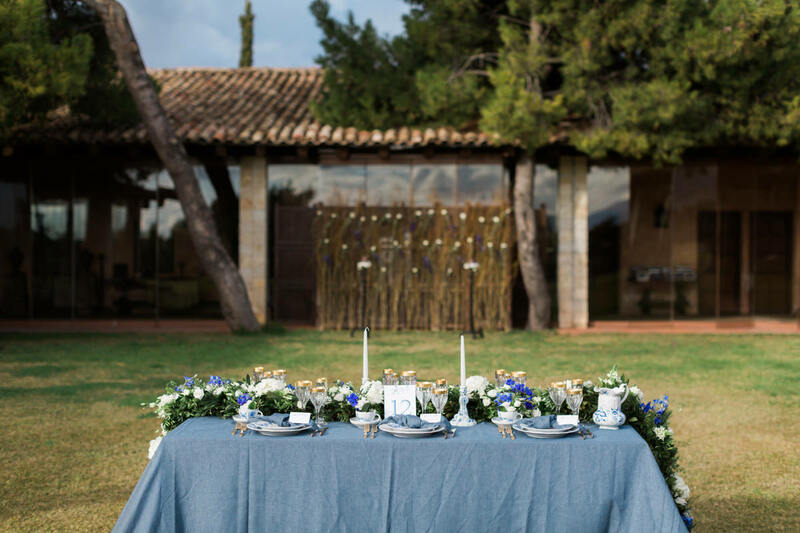 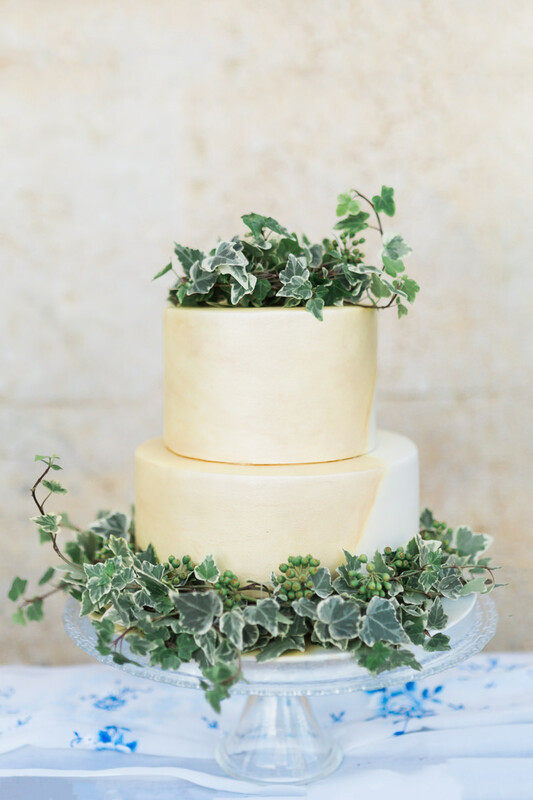 A romantic dessert stand was prepared, to match our colors and style, with two impressive cakes in blue & ivory colors with touches of gold and ivy, handmade cookies with our printed blue onion porcelain pattern and traditional Greek mini sweets, all handmade by Piece of Cake. 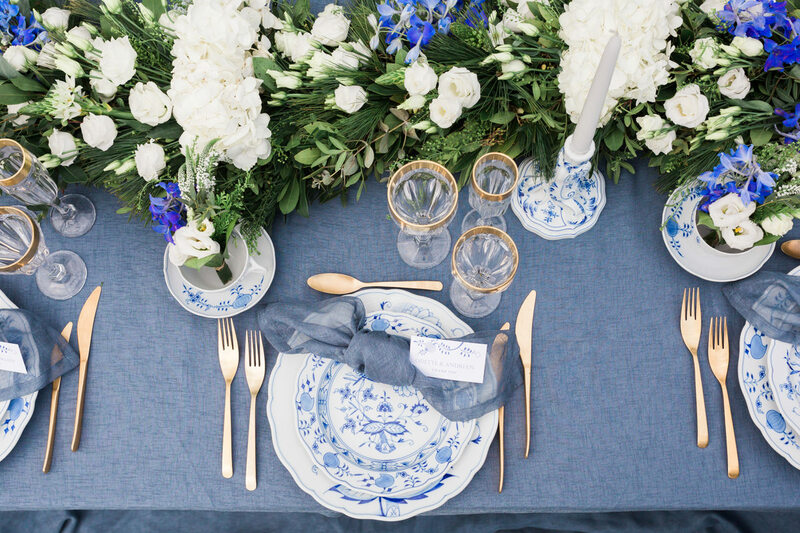 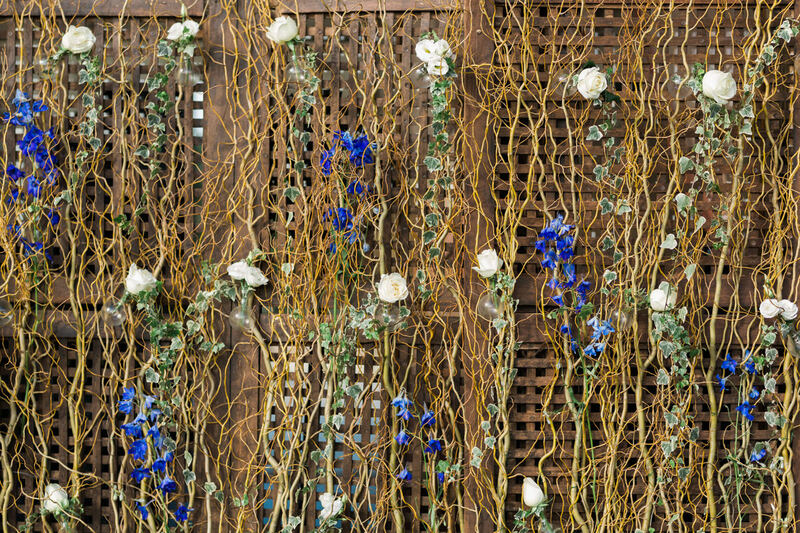 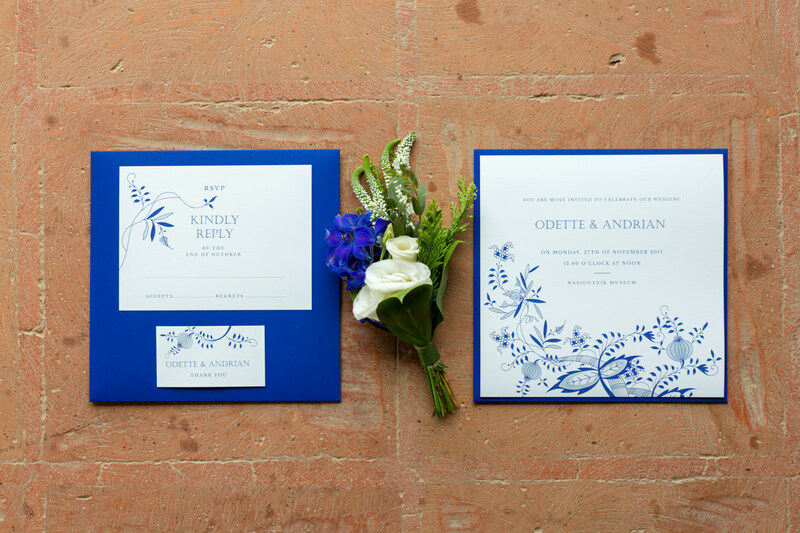 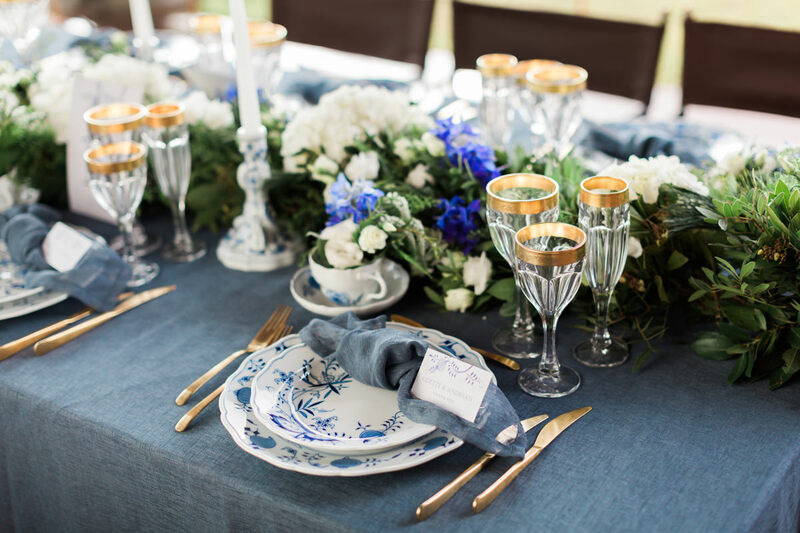 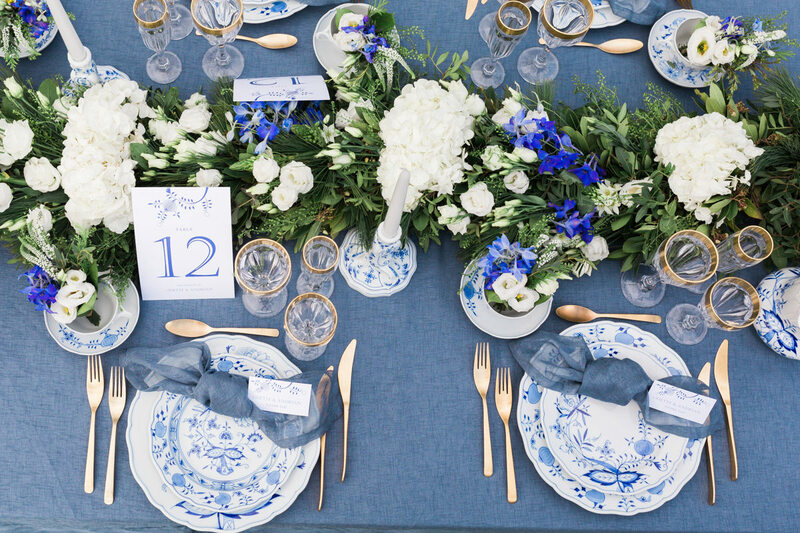 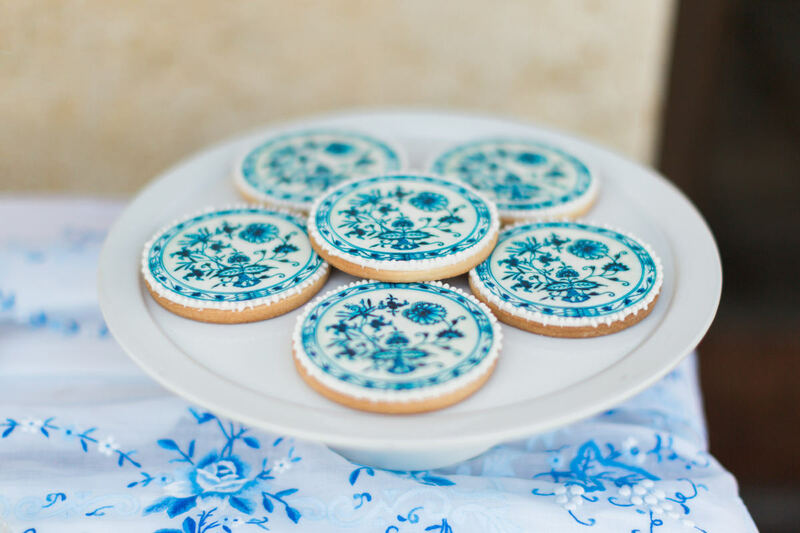 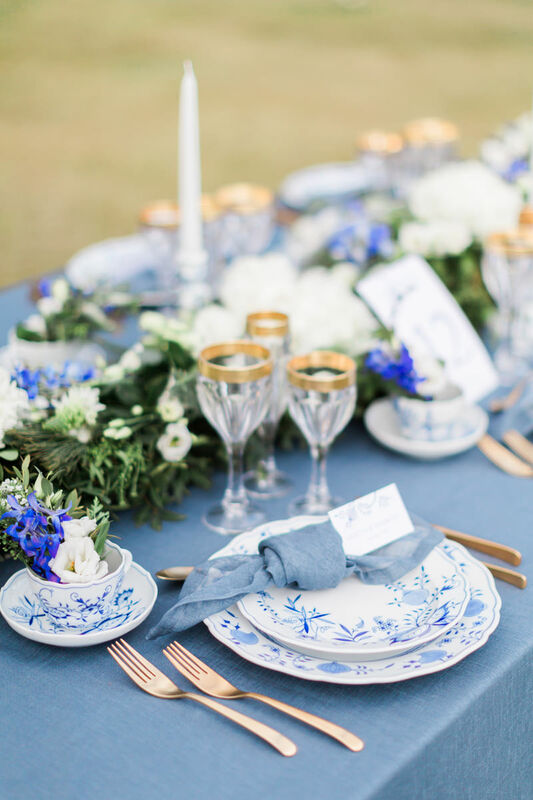 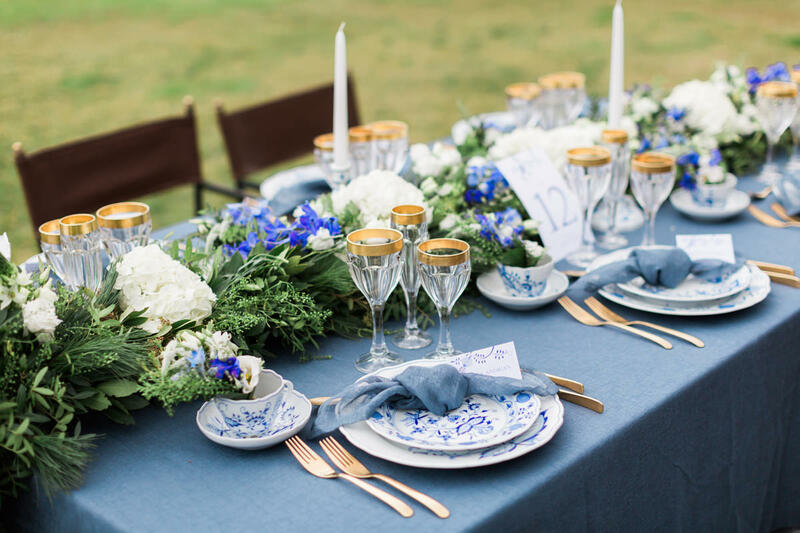 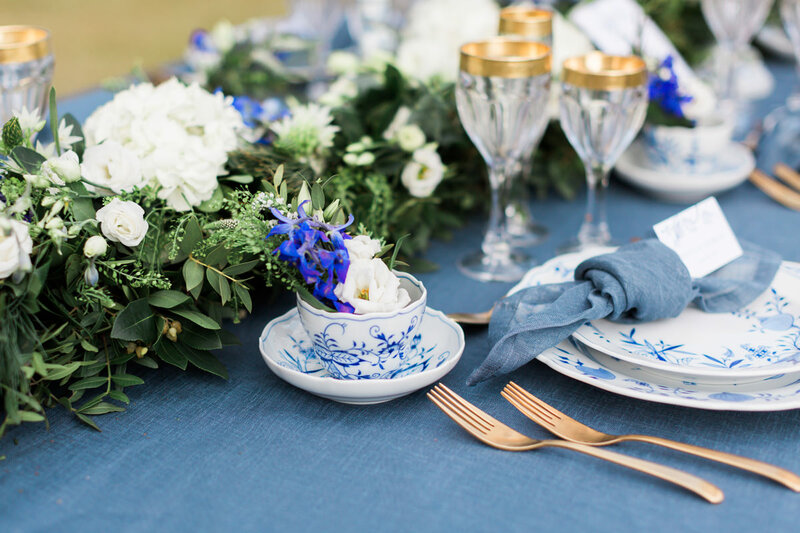 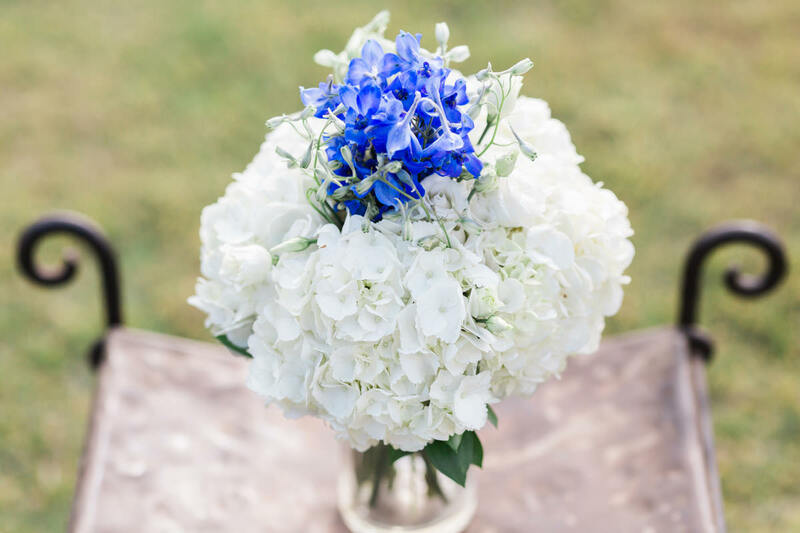 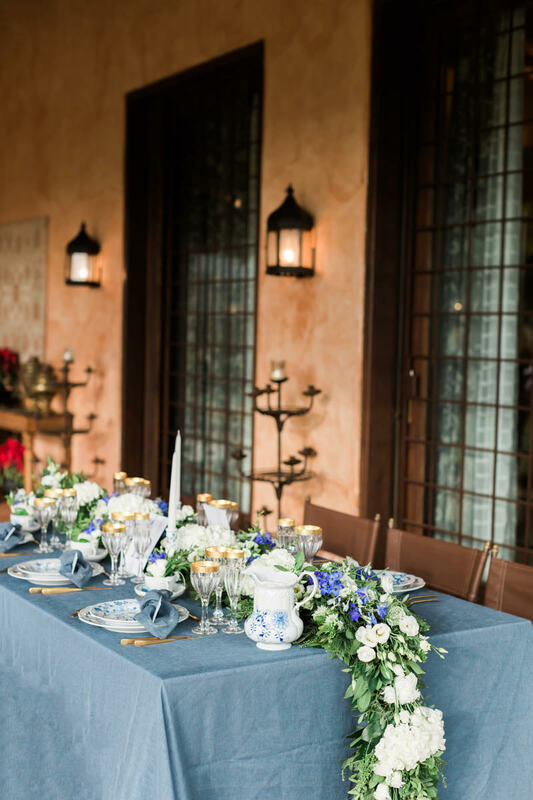 Our Royal blue story – wedding invitation kit drows inspiration from Meissen’s blue onion collection. 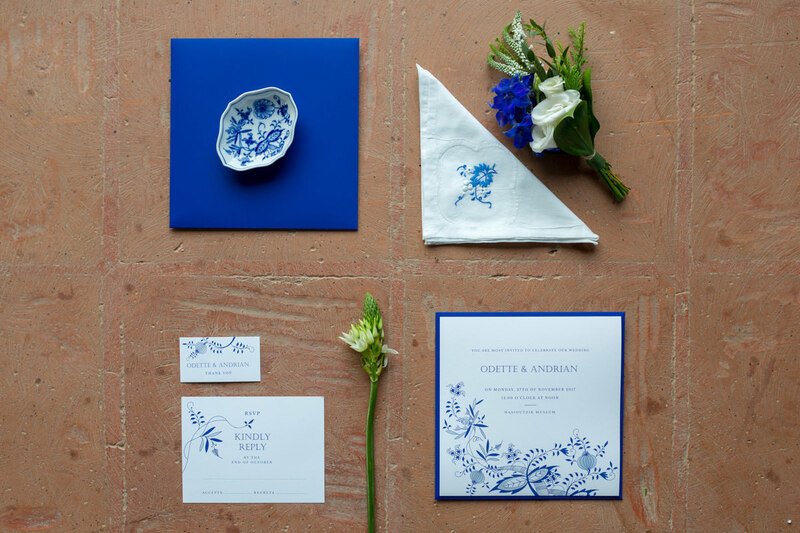 The deep blue envelope in combination with the premium and special quality of the papers, gives a luxurious and sophisticated look & feel, all by Just Invite. 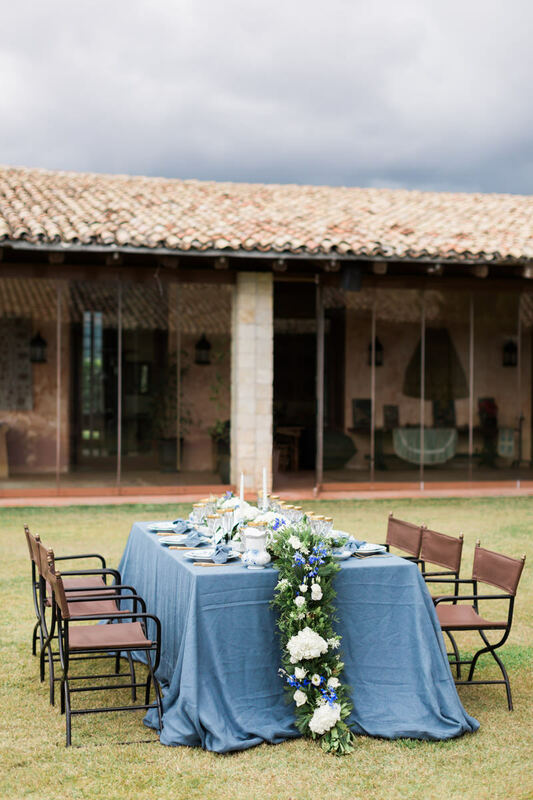 Special Thanks to Nasioutzik Museum for hosting our work while our team and couple enjoyed a unique countryside paradise!